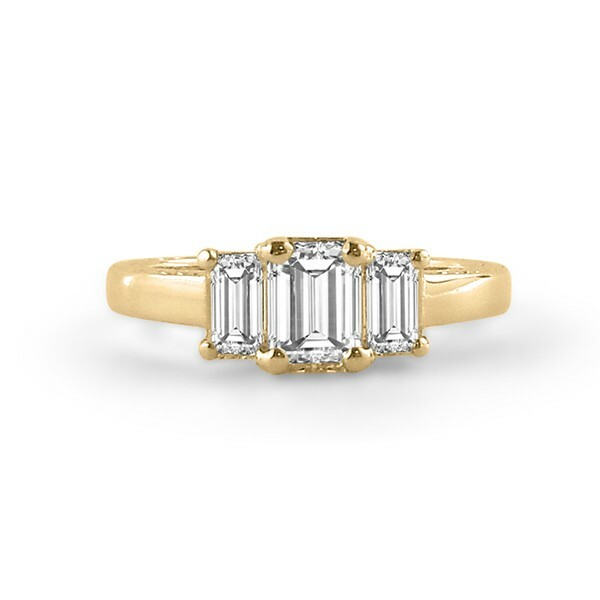 This classic three-stone engagement ring features three emerald cut diamonds, and can be made in platinum, white gold, yellow gold or rose gold. The uniqueness of emerald cut diamonds comes from their cut, which was originally developed for emeralds (thus the name). Because of this unique cut, these diamonds sparkle differently than most other diamonds. Emerald cut diamonds are step-cut on the underside and have a large, open, flat table on the top. This produces a hall-of mirrors effect, with flashes of dark and light created by the interplay between the planes. They are less fiery than other diamond, but the long lines and dramatic flashes give emerald cut diamonds a vintage feel and a sophisticated appeal.